Deep mud on a section of the Worsley Trail, Isle of Wight, 19 Jan 2015. 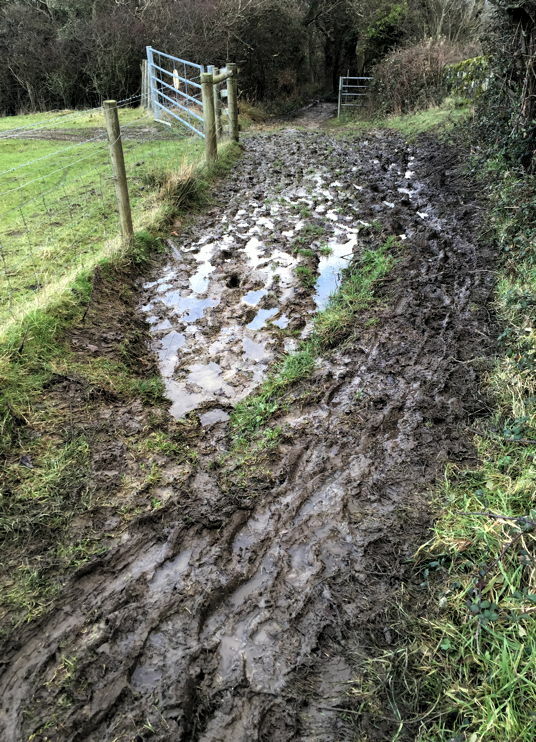 Two pervasive problems make country walking unpleasant at this time of year (Jan-Feb): mud and fences. They are of course linked, because without fences there would be little mud, and without mud, fences would be less of a problem. Neither is insurmountable. I have boots which are both mud/waterproof and good for walking, unlike wellies, and high waterproof gaiters. By sticking to official footpaths – sometimes in more ways than one – fences are just an eyesore rather than physical obstacles. But they act as strong discouragement for many who need to get out and walk more. Western, and other, nations have a serious problem in the deteriorating fitness of their populations. Like many health issues, the cost now is but a fraction of what it will be in the future, so we are not doing enough to address it. Getting out on foot is an excellent way to start getting people more active, fitter, and less obese. It is also remarkably cheap, both for those who walk, and for communities and countries to support. The Isle of Wight has, on paper at least, one of the best networks of footpaths of any part of the UK. It is possible and highly pleasurable to go from almost any point on the Island to any other without having to walk along busy roads. Walking those paths is one of the keystones of the tourist industry here, which in turn is a large part of the Island’s economy. But the fabric on which our fitness (and health) and tourist industry so depends is neglected. Whilst the UK spends billions on roads, footpaths see only a tiny fraction of that. Most footpaths have never had any more than the occasional summer mow when their grass and weeds reach waist height. With the failure of any English law to give a ‘right to roam’, walkers here are still confined to the narrow corridors they share with horse-riders, mountain-bikers, farm machinery, cattle, sheep, dogs, and the occasional motorbike or 4×4. With so much traffic in such constrained quarters, it is not surprising that during the winter months our paths are trenches of deep liquid mud, whilst on the other side of the fence are empty and Elysian fields. If no-one is prepared to put public or private money into them, can we not have effective self-help organisations to maintain our footpaths? Posted in Life and tagged access, footpaths, Isle of Wight, walking. Bookmark the permalink.